I have been playing Spore! I have been hating Spore! Oh, is Spore a terrible game and a waste of possibly the best game concept ever, and that’s something I’ll be expanding on more next week. 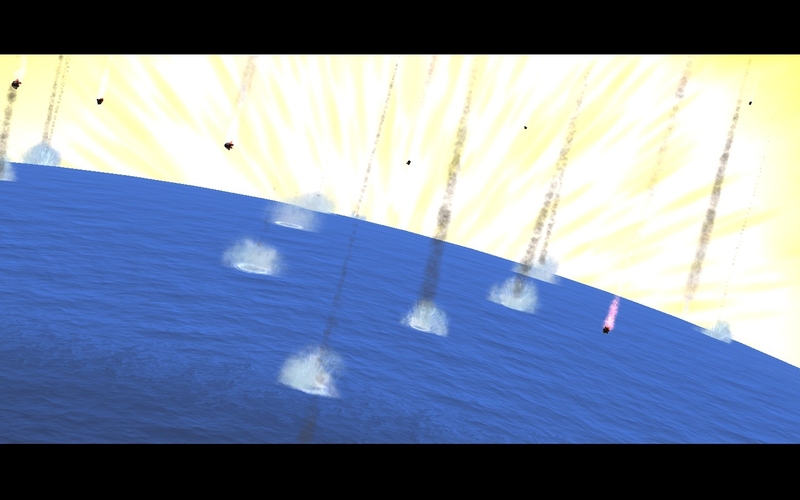 This week, though, I’m going to talk about one of the very first sequences you see when you start a game of Spore: a very pretty crystal-studded asteroid flits past a star, approaches a planet, breaks up in the atmosphere and plops down into the ocean, where it releases cells that form the basis of organic life and starts the first stage of the game. This is actually a legit scientific theory called panspermia. Panspermia is the idea that life can be propagated from planet to planet – if not from star to star – by asteroid impacts, and key to this is the mechanism by which asteroid impacts beget other asteroid impacts. 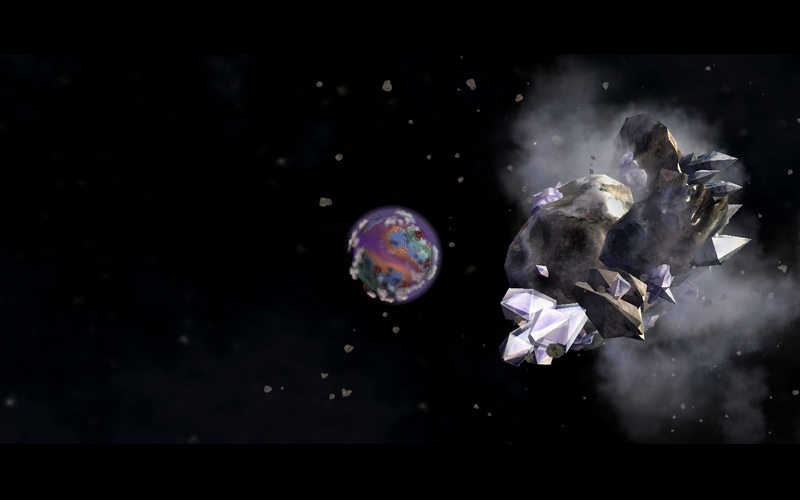 If you have a really, really big asteroid impact – the sort which vaporises a not-insignificant area of a planet’s crust and forms a huge crater – it’s going to throw up a crapload of debris from the surface of the planet. Most of this debris will eventually fall back into the planet’s gravity well and become part of the planet again. However, it’s possible for an impact to be energetic enough that it sends a few fragments of the planet shooting off at speeds greater than the planet’s escape velocity; this means they skip merrily out of the gravity well and into interplanetary space. When you hear scientists refer to asteroids and meteorites as pristine, untouched relics of the early solar system that can tell us much about what the planets were like billions of years ago, this is what they mean. If a fragment was knocked off of a planet just a few hundred million years after its formation it is in effect fossilised planet immune to any of the resurfacing processes (tectonic activity etc) that usually destroys rocks older than a billion years or so. This is interesting in and of itself, but panspermia posits the theory that microbial life might develop on one planet and then hitch a ride on one of these planet fragments to a neighbouring body, kickstarting the development of multicellular organisms there as well. I find this idea fascinating in its audacity, because while it’s certainly possible there’s a fairly large gap separating that and plausible. Any microbial life would have to overcome several not insignificant hurdles during its little jaunt through the cosmos. Surviving the initial impact on the planet of origin. Surviving anywhere from 1-10 million years in space. Surviving the second impact on the destination planet. The second point – survival in space – used to be considered highly unlikely, but the odds of that sort of thing happening have gotten better in recent years with the discovery of extremophiles which are perfectly capable of living – and thriving – in environments which were previously thought to be far too hostile to support any form of life. It’s still an awful lot to ask for them to be surviving on an asteroid over million-year timescales, even if it is possible that the interior of the asteroid might provide a somewhat-protected environment. However, the impact question is the real doozy; asteroid impacts are ridiculously energetic and often vaporise the impacting body entirely. How on earth are microbes supposed to survive that? Well, they’re not. You’d need a particular kind of impact in order to even consider the possibility of microbe hitch-hikers surviving; the kind where the impacting body undergoes a lot of ablation as it passes through the atmosphere and impacts the planet (carrying away a lot of heat in the process). You need a bit of the asteroid to reach the surface of the planet intact somehow. Then it’s just a matter of finding out if microbes can survive the velocities and forces involved in an impact scenario, and this is something we (well, the people who were there before me) used to test in the laboratory up at the university. Take a standard light gas gun projectile. “Dope” it in bacteria. Fire it at something. See if any of the impact sites have live bacteria present. If yes, then congratulations! Panspermia might be possible. Unfortunately for the theory the answer mostly turned out to be “no”. You smash something into a rock at 5 km s-1, what you’re going to end up with is fractured rock and notmuch else. However, there were a couple of positive results involving impacts into aerogel. Aerogel is wonderful stuff. It’s basically a liquid gel with the liquid removed through a drying process and replaced with a gas – hence aerogel. 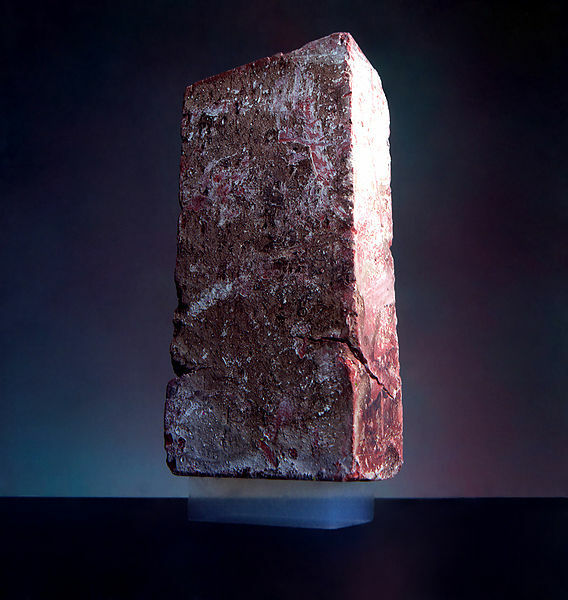 This produces a solid material which – because it’s mostly made up of gas – is incredibly light and also very strong for its weight; the comedy picture above is stolen from Wikipedia and shows a 2.5kg brick being supported by a 2g chunk of aerogel. That said, aerogel is somewhat brittle (or friable) and if you put enough pressure on it to break down the structural matrix left over from the drying process it’ll simply shatter like glass. Now, because it’s made up of a few solid molecules interspersed with large portions of gas, aerogel is very good for capturing small objects – sand grains, dust particles – moving at velocities on the order of several kilometres per second. When they pass within the aerogel matrix they don’t vaporise as they would on impact with a solid because there’s not much of the aerogel that can actually be called “solid”, but they do slow down due to striking these solid molecules and losing kinetic energy. Make your aerogel thick enough (and it doesn’t need to be that thick, only 10-20cm or so) and the small object will stop altogether, being captured relatively intact. This is basically the kindest impact scenario possible, and it should come as no surprise to learn that you can get live bacteria out of an aerogel impact. So it is possible. Just really, really unlikely. Sadly, despite the large body of work that’s been performed to investigate panspermia we’re no clearer on the question than we were when we started. We still do not know if it’s an actual viable mechanism for the transfer of life from planet to planet, and this is a problem that goes beyond the inconclusive results of the laboratory experiments. As with most problems that involve the question of life in the wider universe, it’s one that keeps coming back to one simple fact: the number of planets with known organic life remains at just one – the Earth. You can’t draw any sort of conclusion from a sample size of one; it’d be like measuring the height of one person out of a group of thirty and then concluding that all thirty people are that height. So until we actually find life on other planets we won’t ever know for sure if life on other planets is a possibility, or if related theories like panspermia are viable. It’s a catch-22. No. Wikipedia tells me the first aerogel was created when two scientists had a bet as to which of them could remove all the liquid from a gel, showing you what scientists get up to for shits and giggles. We are unlikely to encounter a planet made out of aerogel, but it does indicate that if you had a very, very favourable set of impact conditions (slow asteroid impact into an ocean) you might be able to retreive some viable bacteria. I’ve been following it for a while, even got the alpha (which is available from that site). It’s certainly interesting, although the AI appears to be a bit broken atm leading to inevitable extinction as the creatures are too stupid to look for food. This will be fixed soon and then I shall be evolving things again!